To Olivier Dauchez, bags are more than a way to tote belongings: they are art pieces. "Bags should be used for a lifetime," he said. The founder of leather goods store D'auchel developed an enthusiasm for the material from young - and that enthusiasm has brought forth an attention for detail. It helped that he had aristocratic roots. The brand name, D'auchel, used to be the family name. "Before the French revolution, the apostrophe meant nobility. The letter 'L' was mistaken as 'Z' in the 18th century." Even though there are no longer nobles in France today, he still enjoyed growing up at the 100-year-old castle at Loire Valley until he was 10. It was where he first got his love for the materials which now make up his bags. Living in a historic building, Dauchez was surrounded by an extensive variety of furniture and ornaments. "I remember there were some very scary armor along the long corridor to the washroom," he said. Apart from metals, there were leathers and other fabrics, raw materials. "The leathers were very old and not in good condition." Adding to that was his fascination by the process of crafting because of his grandfather's scarf factory. "Every morning, there would be bicycles tied with scarf material in front of different houses. The women will roll up the sides and stitch the scarves." Those scenes made a huge impact on the young Dauchez but it wasn't until he turned 14 was when he first tried his hand at leathermaking. "There was a competition on leather item design for young people." Though he didn't win the competition, he received his first experience drawing on leather and understood the possibilities of the material. Little did he know he would be working closely with the material in the future. 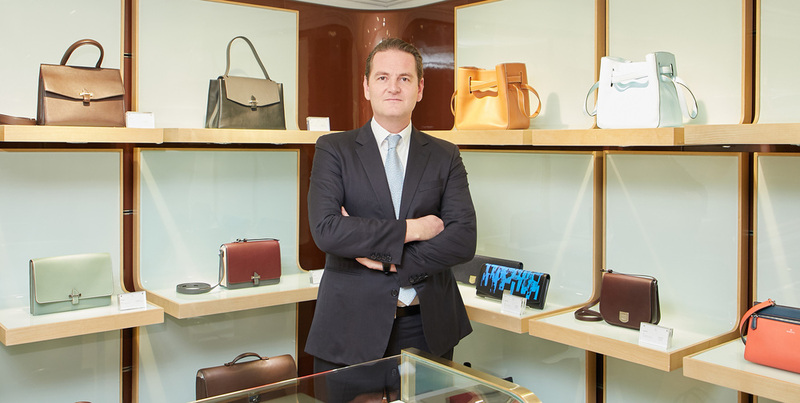 In 1998, the international business graduate was sick of working in a trading company, and started to work for a French leather group - marking a change in his career path. "I learned all the different types of leather and went to another department to learn the techniques of the craftsman," he said. That was when he realized it was just what he had wanted to do. He went on to open a leather factory to start making bags for a lot of big brands. "I cannot say the names because of confidentiality." It was satisfying to work with the materials he liked, but he also experienced struggles at the same time. "It became a bit stressful because you would always have to compromise. I wanted nicer quality, but they want lower prices," he said. He also found that many buyers had no idea why their handbags were so expensive. He had high hopes of D'auchel. 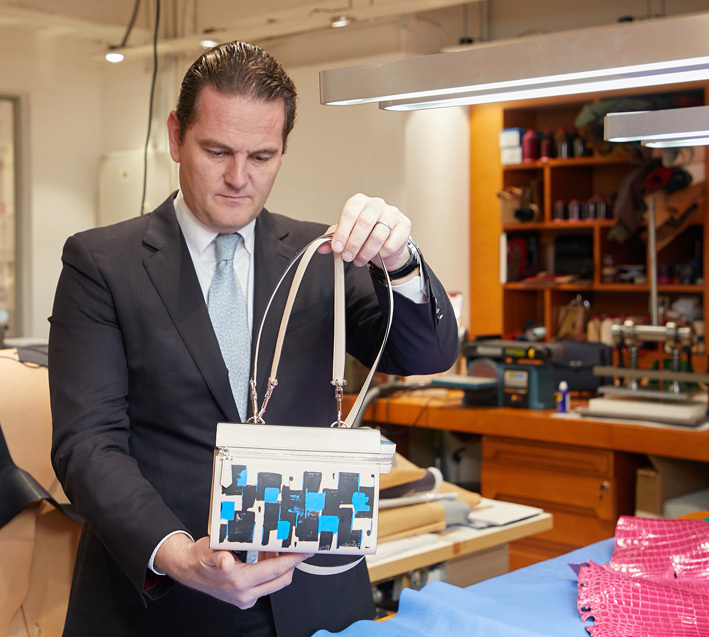 "I wanted clients to meet the craftsmen, let people understand more, so that there will be more of an appreciation when they buy their bags," he said. With the workshop directly in the shop, customers are able to directly engage in conversation with the craftsmen. He said: "Craftsmen know the clients, and bring in customized additions of their lifestyle into their bag." For example, they would add stronger stitches to the wallet of someone who traveled frequently. "They would form their own relationships with the craftsmen. They would want a specific one, because they would know their tastes." Even if it may take up to two weeks to make a hand stitched bag, he believes it is worthwhile. "It's the future of bag making. People can choose from fast fashion or proper goods," he said. Interestingly for a Frenchman, his first store was in Hong Kong instead of his home country. "I wanted to show French craft in Hong Kong," he explained. Though the city has many big brands and choices, he did not think it was a challenge. "It is for different types of people," he said. "Elegant women do not have to carry brand names to be recognized. Someone looking for something unique and high quality comes here." He says that even though people do not know the brand, they would come because they see the passion behind making the craft. Another reason the businessman chose to come to the SAR is because of his family. His wife is from Hong Kong. Though he described Hong Kong as his second home, he still holds to his French roots and named all the bags after his family. His wife Wendy, seven-year-old Theo, six-year-old Luca and two-year-old Lena have all been immortalized in bags. "The children love to see their own products, and they always love to come on Saturday to have lunch and play with the craft," said the proud father. They are too young to make their own bag, but they are attracted to handicraft, just like their father. "Theo has hand stitched leather before," he said. "He once created different city scenes on one piece of leather." The bags are not only tailor-made for the clients, they are also adapting to the life of the Dauchez family. "There is always a lot to bring when we bring the kids out," he said. "So Lena is made for the need of mothers." The bag Lena was capable of carrying baby Lena years ago, showing the importance of his craft in his everyday life.